Cedar Grove Garden Center | Retail, Landscaping, Tradition. Over 125 years of mom-and-pop gardening. 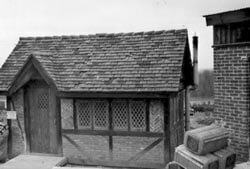 The history of the Cedar Grove Garden Center dates back to the late 1890’s. It has been in the Cox family for 5 generations. We have grown from a small floral shop into a full-service landscape design company and retail garden center. Philip’s son Theodore Francis Cox loading a tree for delivery and planting at his nursery, located at 56 Alexander Avenue (across the street from his father’s nursery). 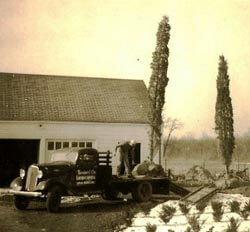 Cox’s Landscaping began at 32 Brookfield Road, Upper Montclair, at the turn of the century with Thomas’ son Philip. This building was originally at the corner of Lorraine and North Mountain (next to the train tracks) and used by a British landscape architect who operated his business in it from 1920 to 1940. Theodore Francis Cox purchased the building for $50.00 in 1945 and had it moved to our current location at 1201 Pompton Avenue, Cedar Grove where it become our first office. 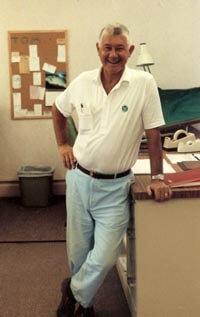 Theodore Frederick Cox in our new landscape design office at 1201 Pompton Avenue, Cedar Grove, circa 1990. 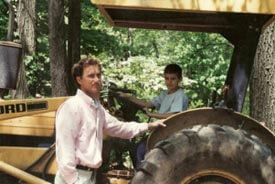 Theodore Frederick Cox Jr. (who joined the business full-time in 1978) and his son Theodore Francis Cox II.